It is my wish that you're enjoying this and past entries in my Most Overlooked series. If not, you will get your money back-- no mess, no fuss. We've been through the DS and PSP one time around, so let's take a look at the market leader this generation, the Wii. There's plenty of great games that are tossed to the wayside in attention for one reason or another, so here are just a sample of some Wii games you may want to track down. All of which are worth your effort, and most of these games touched upon have reviews by yours truly if you want to look into them even more. I had listened to the Dissidia: Final Fantasy (PSP) remixed collection of past Final Fantasy tunes, and I was amazed how much better Final Fantasy Fables: Chocobo's Dungeon's soundtrack was in comparison. The game is a traditional rogue-like, but it's nowhere near as unforgiving as the more infamous games of the genre. Many memorable songs, characters, summons, and creatures from the Final Fantasy universe are present, and the game's difficulty is one that you can ease into rather, well, easily. The game is full of charm, a word I like to use for games of this nature, and the quest is long and full of optional goodies to partake in. For those tired of heroes and heroines with teen angst and attitude problems, let Chocobo into your home instead! I had never played a Wario Land game since Super Mario Land 3 if that even counts. I'm unsure of the chronology of the series. Regardless, Wario Land: Shake It (or Wario Land: The Shake Dimension pending on where you are in the world) was accessible to any type of gamer. Those just looking to breeze through the game could do so. However, those wanting to complete the in-game challenges and gather all the treasures would appreciate the ingenious level design all the more than not doing so. Additionally, the game's soundtrack is one of last year's best showing that great melodies and catchy songs so a long way. I thought having the acronym as BWii was ingenious. It's so simple, but it works so well. It's unfortunate that Battalion Wars II was overlooked. The game was released during the same holiday season as Super Mario Galaxy, Metroid Prime 3, and Fire Emblem: Radiant Dawn, so perhaps that was one of the contributing factors into it be less talked about. All of the tactical, real-time action of the first BW was present, and BWii brought with it online play for two friends to blow their enemies away with. It's a shame Wii Speak wasn't around then, because the game would have really benefited from it. 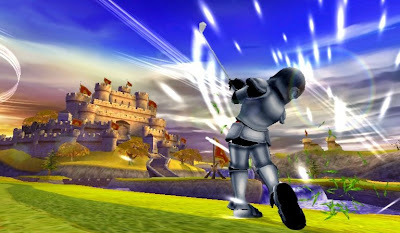 I'm sure most people would have prefered Camelot making a Mario Golf game instead of creating a new property altogether. That doesn't We Love Golf any worse, however. With eight traditional courses, three short courses, multiple mini-games, a cast of characters who could wear a host of Capcom costumes, online play, and a fitting soundtrack by Motoi Sakuraba (Tales of, Star Ocean, etc. ), We Love Golf has a lot of content to it. The swing system may not work like Tiger Woods, but it's easy enough to pick up and play and enjoy. You can now get the game for twenty dollars at most retailers, so there's really no risk in purchasing this great golf game. Perhaps you can play it while you wait for Tiger Woods 10! Blast Works is a "your mileage may vary" type title. For someone who likes creating and are interested in game design-- even a passing interest like myself-- there's a lot to enjoy in this game. The single-player campaign is a bonus. Others who have no desire to make their own creations and levels will probably not have much to appreciate as the campaign is relatively lackluster even with the innovative gimmick "attached" to the game. For the former, there's plenty of content from other players sent from WiiConnect24-- levels, ships, enemies, background objects, and more for aspiring designers to adore. While I can't condone EA's fixation with immediately squeezing the franchise dry with spin-offs in the form of MySims Party and MySims Racing, the mainline MySims games are honestly enjoyable romps. The first game was more construction-happy with little in the way of variety when it came to objectives. 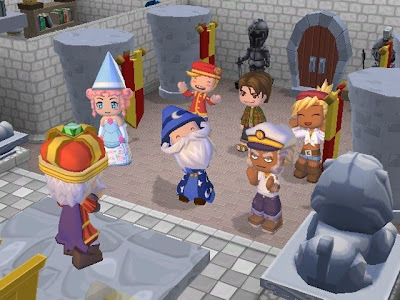 MySims Kingdom remedied this by having the player utilize in each building challenge a specific number of essences-- the building blocks of the MySims franchise. Not only is the game entertaining, the dialogue is mighty humorous as well! Stay tuned for a look at the HD consoles in the coming weeks right here on SuperPhillip Central! Donkey Kong Barrel Blast was panned by critics. Like some people enjoy Too Human, I enjoyed this game. It controlled well, I seldom had any issues, the game was fun, and I loved all the Donkey Kong Country cameos. As we make our way to Thursday's New Play Control! Donkey Kong Jungle Beat review, here's a look back at Donkey Kong Barrel Blast. If Kong is Wrong, I Don't Want to Be Right. Donkey Kong Barrel Blast is a racing game that's been a long time coming. Rare originally unveiled a title for Nintendo's at that time new console, the Gamecube, called Donkey Kong Racing. When Rare was purchased by Microsoft, the title turned into vaporware and was never talked of again. Fast-forward to the end of the Gamecube's life cycle, and Nintendo announced Donkey Kong Bongo Blast for the Nintendo Gamecube-- a title that would utilize the bongo peripheral used for four other titles: Donkey Konga 1-3 (3 is Japan only) and the criminally underrated Donkey Kong Jungle Beat. However, with the success of the Wii, Nintendo decided to move development of this title from the Gamecube to their new motion-sensing machine. Now with a new name and without the ability to use the bongo controller and new motion-sensing controls, does Donkey Kong have a new hit ripe for the taking, or is this racer a sour banana? DK speeds through this sweltering desert. Donkey Kong Barrel Blast has DK and friends equipped with jets powered by bongos. This game is essentially a kart racer in lieu of the massively successful Mario Kart franchise. . Nonetheless, Barrel Blast is much more restrictive when you're racing. DK and others are always moving forward on a set track. Sure, you can move left or right, but back-tracking is never an option to the player. The game is controlled solely by the Wii remote/nunchuk combo. To gain speed, you're supposed to alternate moving between the Wii remote and nunchuk. Once you've reached maximum speed, all you need to do is shake the nunchuk to move left and waggle the Wii remote to glide right. It's as if you're banging imaginary bongos. Hit an obstacle such as a steel keg or get hammered by an item, and you'll need to alternate between both hands to speed up once again. Strike down both controllers at the same time to perform a jump. However, between alternating hands to speed up to pounding down both hands to jump, sometimes you'll accidentally register a jump when you don't mean to causing frustration. Like Mario Kart there's seven other racers to contend with. Press the A button to initiate a punch to knock out other racers for a brief moment or to smash through wooden barrels. Another nod to Mario Kart-inspired racers are items. There's a wide array of them as well from laying a row of fiery bananas on your trail to sending out a purple bird named Quawks to mess with the player in first place. The AI will use these items to their advantage as well, so watch out. The controls might appear simple just like the game mechanics themselves, but they're deceptively so. By collecting bananas spread around each track, you'll slowly build up your Wild Move gauge located on the right side of the screen. When it fills up, you can perform a Wild Move by holding down on the control stick of the nunchuk. This move allows you to jet faster than max speed while crashing past other racers and some course hazards. By slamming through a wooden barrel while in Wild Move mode you can extend the length of the move's duration. This means that if you keep propelling through wooden barrels you can prolong your Wild Move to extended periods of time. Players will most likely find some insane combos to blaze past and ahead of the racing pack. While your beginner mode is rather slow, the other two difficulties offer tighter competition and faster speeds. The tracks themselves are all suspended above air. Players are confined to the insides of the track, and all they can do is move left or right to grab bananas and avoid other racers and obstacles such as TNT barrels, steel kegs, and items. Shortcuts come in the form of rocket barrels that send players to other parts of the track. Red barrels shoot the player out allowing them to perform mid-air poses (by shifting the Wii remote left, right, up, or down when prompted) to earn even more bananas. Additionally in some levels, your racer can open a box containing either Enguarde the swordfish (in underwater races) and Rambi the rhino (in land races). You'll then ride your animal for a short period of time, smacking away obstacles and other racers while being given a fast ride. While there are sixteen races in all, many of them borrow track pieces from other races. What I mean is that the underwater races will feel quite similar except for a few changes. While this might seem lame, well, that's because it pretty much is. Track locales range from the jungle of DK's home to an erupting volcano, to a shimmering sea, to an icy mountainside, to a sky-high temple. ...Or a familiar animal buddy. Barrel Blast offers numerous modes to partake in including the standard circuit gameplay. At the end of each race you're awarded points depending on the place you received. Have the most points at the conclusion of a cup, and you're the victor. There's also Candy's Challenges where you'll need to complete a set of eight challenges to unlock the next level of eight. These challenges range from collecting a certain amount of bananas within a time limit to helping another racer get first place in a race. The levels of challenges get progressively more difficult, and even after you've completed them all (all 32 of them), you'll have the option to go back to beat your records. To round out the package there's your mandatory time trial mode and versus modes for up to three other players locally. The cast of Donkey Kong Barrel Blast is wide as it totals to sixteen different racers-- eight Kongs (Donkey Kong, Diddy Kong, Dixie Kong, Tiny Kong, etc.) and eight of the Kremling klan (Kriiter, Kip, Kalypso, Kludge, etc.). Each racer has their own stats from how fast they reach max speed to how long their boosts are. Of course, only a handful of racers are available at the beginning, but by completing cups and Candy's challenges you'll be set to unlock them all. Compete with up to three other players locally. Donkey Kong Barrel Blast is definitely a Gamecube game ported over to the Wii. However, it still beats the pants off of a vast assortment of Wii titles graphically. The tracks are colorful and vibrant, blur effects are a nice touch, and the characters and models are all crafted well. There's no sign of slowdown or framerate stutters, and for the most part you'll be able to keep up with the action. The omission of the bongo controller is questionable, however. I feel that this title would have benefited from both control schemes. The price tag is another problem as well. It's a fifty dollar title at the game's launch which seems a little steep considering that the game isn't overly complex and the length of unlocking everything isn't very long. DK's latest console outing may not set the gaming world on fire, but it's a fairly competent racing title. It might feel dumbed down especially to those coming in from racers with more depth, and the controls are decidedly something to get used to. Many will easily get frustrated with learning the controls, but for those who persevere there's a lot of fun to be had. Those complaining about how slow the game is have obviously not unlocked the easy to obtain difficulties offering speedier gameplay and closer races. For what this title sets out to do it's an enjoyable romp that Wii owners should at least give a chance. New Play Control! Donkey Kong Jungle Beat ships to retailers today. With one quirky platformer comes another with DK Jungle Climber for the Nintendo DS. Here's a review of why you shouldn't miss out on this entertaining game! DK: King of Swing was an incredibly underrated Game Boy Advance title buried under other hits on the portable platform. Several years later, Paon is back, developing the sequel to that gameplay gem, DK Jungle Climber for the Nintendo DS. Does a duo of screens do Donkey Kong justice, or is this sequel a sour banana? Thankfully, this title does DK: King of Swing proud. When a gargantuan banana appears at the summit of the tropical Sun Sun Island during one of the DK crew's many days relaxing on the beach, it's up to them to investigate. Turns out the banana isn't of the edible variety-- it's a spaceship piloted by a talking banana representing his banana species. ...Yeah... okay. Players should leave their skepticisms of the story at the front door. There's a plethora of locales DK and Diddy will traverse. Everything begins with a skip-able tutorial lesson from Cranky Kong who'll show young whippersnappers the ins and outs of the beginning abilities DK has to unleash upon his foes and to progress through the various stages. DK Jungle Climber, much like its predecessor, has an innovative control set-up. The aim of the game is to use the L and R buttons to climb pegs to advance. The L button controls DK's left hand while the R button controls DK's right. When DK only has a hold of one peg in one hand, he'll simply spin around the peg in a circle. If the vertigo gets to players, by grabbing two pegs with both hands, it sets DK in place. The A button performs a charging attack perfect for speedily climbing pegs or bashing various foes out of the way. The gameplay is quite simple in the first levels, but it leads the player into a false sense of security. There's a lot more to DK Jungle Climber than scaling stationary pegs. Later levels have falling pegs, barrels that need to have a rock tossed at them from far away, and switches that are pulled by holding onto one side with DK's right hand and continuously pulling the lever with DK's left. There's icy rows of pegs which cause DK to slip and lose traction upon, there's giant cobs of corn that spin like tires, and pegs that move in odd patterns. There's a lot more variety than one would expect in a game that is primarily L and R, and each level usually introduces a new gameplay principle to the table, so players will ease into each new challenge and never feel overwhelmed. Many Donkey Kong Country veterans won't touch a new DK game because it's not exactly a new DKC title. These people are what we call morons. This game is strikingly similar to not only past DKC games but also the first DK King of Swing title. Instead of the cartoony style of King of Swing, DK is back to what appears to be a 3-D model along with other "sprites". 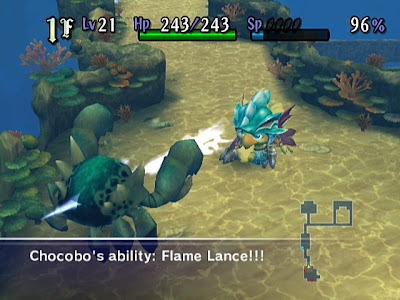 Several enemies from past games return such as Zingers, Flitters, Lockjaws, Neckys and more. Diddy Kong could be unlocked in King of Swing, but in Jungle Climber he's readibly available. Unlike, DK: King of Swing where players could regenerate their health by collecting and then using bananas, DK, along with Diddy, are two-hit wonders. If DK gets hit with Diddy, Diddy is lost. If DK doesn't collect a DK barrel before getting hit again, the player loses a life. This fact makes DK Jungle Climber much more difficult than the game that preceded it. Have Diddy help you out of a jungle jam! There's new moves that DK and Diddy can use as well such as power-ups like the hammer and feather. The hammer gives Diddy Kong a giant weapon to spin around and clobber foes and certain breakable blocks with while DK climbs as normal. The feather gives DK and Diddy each a feather to float and fly past obstacles, enemies, and reach new heights. By collecting 100 multi-colored stars, players can touch the bottom screen making DK and his buddy invincible and able to fly around for a limited amount of time. This move is great for reaching an alcove that's otherwise a pain to reach normally. Finally, players can double-tap the A button to send Diddy flying toward an enemy (a great way to pummel those pesky Zingers), an out-of-reach item, or an away platform. If going from point A to point B isn't all a player is into, they can opt to collect a multitude of items mid-level. There's the good old fashioned K-O-N-G letters which will give the Kong crew an additional life to work with. Also, who could forget those sneaky DK coins that when enough are collected, new cheats are unlocked such as 20 extra lives to work with when the player gets a game over or a faster hammer power-up to work with. There's five banana coins in each level which unlock new, fiendishly difficult extra stages once the final boss (who is one of the hardest in recent memory on a Nintendo plaform) has been defeated. Last by not least, there's oil barrels hidden in most of the levels. Get enough and Funky Kong will charter his plane to you and take you to a secret level. Each of the six worlds (mostly of five levels each) concludes with an epic boss battle. Some are more memorable than others, but the majority are intuitive and pretty challenging actually. From taking down a gigantic Kremling mech to bashing down a possessed dragon, each battle will put your skills of climbing and dodging to the test. The first boss- a giant banana battleship! There's more to do outside of the adventure mode. Challenge mode offers a myriad of mini-games to play and attempt to perfect. There's climbing challenges, banana-grabbing games, barrel-busting bonanzas, barrel-jumping contests, and booster barrel races to partake in. Players get a letter grade based on their performance (up to AAA), and these unlock even more new content for ambitious players to enjoy. various minigames for high scores. DK Jungle Climber is incredibly polished. The controls are responsive, the presentation is remarkable, and the game presents a solid challenge to those who see it all the way through. The game is colorful, vibrant, and a joy to look at, the music is easily recognizable and memorable, and the amount of content the game offers is fantastic for only $29.99 USD. My only problem with the title is that it has six worlds, but completing the main adventure mode only takes 5-10 hours for most players. However, there are additional modes to unlock, extras to play through, and high score records to demolish. Some players may also find the formula getting a little stale and repetitive by the tale end of the game. DK Jungle Climber is a step (or I guess in this case, peg) above DK: King of Swing. Is it as good as the Donkey Kong Country series? That's not a fair question to ask as the games aren't overly similar. Nonetheless, anyone who picks up Jungle Climber will go bananas with all the excellent gameplay, challenge, and fun to be had. It's easily a fantastic DS game, and I recommend it to anyone despite a couple problems. We had a lot of fun dedicating weeks to various video game franchises, but now it's back to business as usual with multiple series being spotlighted each week. This week we have a spotlight all on Wii games with Wii Music, Wario Land, and many more! Nintendo botched the presentation of Wii Music to the gaming crowd and media. It immediately turned everyone off. Fortunately, there was much more depth to the game than Nintendo presented. I very much enjoyed playing my own interpretations of the game's songs as well as making versions that sounded nothing like the source song! The lack of structure in the game most likely killed it for most media types. Their loss. I had fun AND it was during my work hours! Get... out... of... my... head...! GET OUT OF MY HEAD! This is the epitome of a catchy song. It's the type that stays inside your head until you finally knock yourself unconscious. Unfortunately it then plays in your dreams and your resulting comatose state. Regardless, Let's Tap is an interesting project by Sonic the Hedgehog's creator and former Sega employer, Yuji Naka. 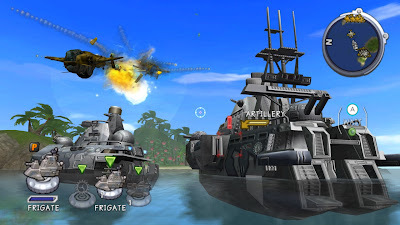 The Wii title is a series of short games played exclusively by tapping. These taps register on the Wii remote causing the desired function. This could be a great party game depending the price, but for me, I've grown tired of most party games in general. V303. Elebits - Fancy Some Candy? This track comes from the overlooked Wii game, Elebits. The game came out on or around launch depending where you live. Until recently I was completely oblivious to the fact that Michiru Yamane (Castlevania lead composer) was one of two composers for this game. This woman has such range! This lively brass-filled funkadelic frolic comes from the rather terrific de Blob video game for Wii. The game sold well according to the publisher, THQ, so I look forward to seeing a sequel somewhere down the line. The music was great in the fact that as the town became more colorful, the music kicked in with new accompaniment and a bigger beat. Eventually when you were in the fourth level of the game, this song is what is heard at the fun's peak. 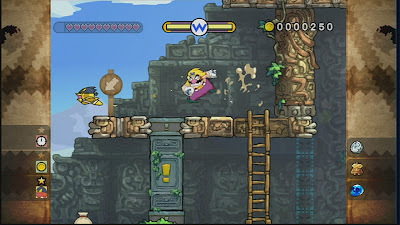 The second level of the first continent in Wario's newest side-scrolling adventure takes place in the humid and sandy sprawls of Whoopsy Desert. I love this track when it kicks it in with the guitar at around 0:55. It's the type of tune that you can bop your head to as you bash away baddies and venture your bad self for bonuses of booty of the treasure variety. Hope we'll see you next week with more classic video game tunes! This is a special occasion here at SuperPhillip Central. This is the first time I've reviewed a game that came out before the release date. We're movin' on up, Weezy! Here's my enthusiastic review of Klonoa for Wii. 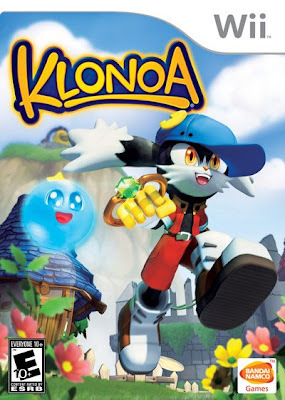 It's been over a decade since Namco-Bandai's floppy-eared feline, Klonoa, had his first foray into gaming with 1997's Klonoa: Door to Phantomile. Since then, Klonoa had a wonderfully delightful sequel on the Playstation 2 known as Lunatea's Veil (2001). Fast-forward to 2009, and Klonoa's debut has been remade with a more sophisticated graphical makeover with the simply-titled Klonoa for the Nintendo Wii. The visual touches are just part of the new budget-priced package, but have the years been kind to Klonoa's original adventure? The mystical ring known as the Wind Bullet. Klonoa features a story that anyone can get into and enjoy. The land of Phantomile is fueled by dreams. Our hero, the precocious adventurer Klonoa, dwells with his grandfather in a countryside wind village. When an unknown spaceship crashes into a nearby mountain, Klonoa and water blob friend Huepow, charge off to investigate. The rest of the tale revolves around a sinister being known as Gladius whose motive for searching for a moon pendant is unclear, but it's undeniable that he's up to no good. It's up to Klonoa to right the wrongs caused by Gladius and his flunky, a jester named Joker-- whose only trick with a pencil is drawing horribly. I must add though that the ending of Klonoa is very much a downer. Great way to spoil my overly cheerful mood, Namco! 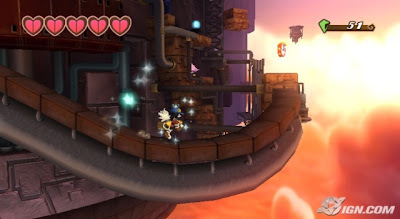 The tale of Klonoa is stretched over thirteen themed levels. At the climax of each second level is a fun-to-face boss fight. These, for the most part, take place in circular arenas where you have to chuck an enemy at the foe's weak point in order to damage it. 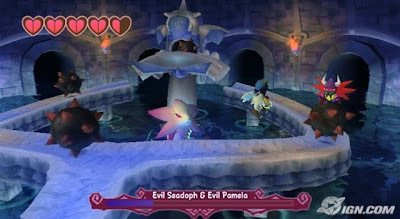 Each level has a different locale to it from the humble beginnings of Klonoa's wind village to traversing the hallways of a castle in a starry sky. There's enough variety in the level design that you'll play for two hours without even knowing it. Klonoa's heroic undertaking is very long, however. The story can be played through in about three or four hours. Regardless, this is one of those beauties like Super Mario World or Sonic the Hedgehog that just begs to played over and over again just because it's an uproariously good time. Everything is more full of life in this remake. What makes the remake of Klonoa easy to breeze through is that you have five hearts to work with this time around. You can get hit ten times before you finally kick the bucket. What strengthens the elementary challenge of the main story mode is that there's a multitude of 1-ups available for snatching either from silver and gold coins to collecting 100 dream shards. That isn't to say you won't die or ever feel challenged, however. There are plenty of tricky and troublesome spots that request your full platforming prowess as well as six captured villagers to rescue in each stage-- 72 in all, so there are some optional goodies to go after while you're not chipping away at Gladius' master plan. After beating the game, you unlock the bounty of bonus content promised with this Wii remake. 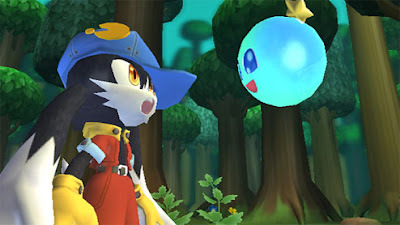 There's a character viewer, movie viewer, new costumes for Klonoa such as his garb from the Door of Phantomile sequel, Lunatea's Veil, as well as a special bonus level and mirror versions of the game's various visions. For those who stockpiled 1-ups throughout the original story, be prepared to gradually lose them all as the challenges within the bonus level-- a tower stage, and the hidden bonus rooms within the mirror levels are insanely difficult. These rooms force you to perfect chaining double-jumps from floating enemies or else face the wrath of the lava pit below. It's a severely sharp difficulty spike when compared to the abundantly accessible story mode, so perspective players may want to stock up on patience and anger-management pamphlets. I would have liked having the original Playstation code of Door to Phantomile somewhere in the package, but it's nowhere to be seen. Who knows? Perhaps besting the challenge rooms will do something, but I was too weak in spirit to complete them all. Klonoa: Door to Phantomile was heralded for having an innovative approach to its game design. 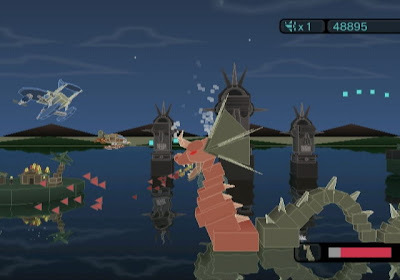 It was one of the first games to mix between 2D and 3D gameplay, thus creating the lovely "2.5D" moniker. The game was also more than your run-of-the-mill platformer, and that has all to do with how Klonoa handles. Klonoa's weapon is the gold, melon-sized ring known as the Wind Bullet. When used, it shoots a gust of wind a few feet away from Klonoa which can pick up small enemies. Once grabbed, Klonoa holds the enemy over his head. Now our hero can toss his vulnerable baddy into another enemy to vanquish two metaphorical birds with one stone, or he can use the enemy in order to perform a double-jump. This allows Klonoa to reach higher places when an ordinary jump just won't do. Like a certain dinosaur from the Mushroom Kingdom, Klonoa can float in place to make it over chasms and make it to platforms otherwise unreachable. 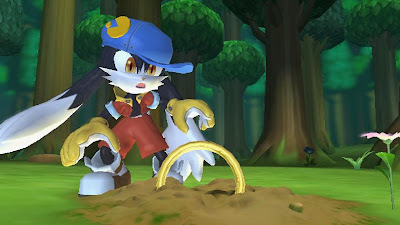 Grabbing enemies is the core of Klonoa's gameplay. There's plenty of areas where the furry protagonist will have to use an enemy to solve one of the game's many environmental puzzles. These range from tossing creatures to the background or foreground in order to hit a faraway switch to chaining multiple mid-air grabs to reach a high platform or face certain death. It's these challenges and the vast variety of them that really make the game design in Klonoa shine. There's multiple moments where you'll just sit back and be amazed that the designers could fit so many unique challenges in a game with only a handful of moves. but their weak point only pops up occasionally. Compared to the original Playstation game, Klonoa for Wii is vastly improved. I particularly enjoyed how the cut-scenes are in-game. This means that the game seamlessly transfers from cut-scenes to gameplay without a hint of a loading screen. It's very cool to go directly into a boss battle or puzzle. As for backgrounds, these are are less empty when contrasted to Door of Phantomile and are now full of life. Additionally, everything is much more fluid whether it's Klonoa's animations or the little graphical nuances in each level like falling leaves or beams of light. New voice work has been added, and most of it works rather well. Klonoa's new voice in particular is superb whereas Joker's delivery is a tad on the off-side. A cool bonus is that if you don't like the new cast or prefer the past cast, you can always switch to the Phantomile voices. For thirty dollars, there's hardly a better deal for a fantastic platformer on any current platform. There's enough bonus content after the story mode is completed to boost the longevity of the game severalfold. If you're like me and never had the chance to play Door to Phantomile, get ready to be wowed. Those who have had the chance will be stricken with a brand new case of nostalgia-- running through familiar stages in a brand new coat of beautiful paint. Either way, there's enough here for beginning players (the accessible main mode) as well as veterans (the unyielding challenge rooms), too. Klonoa gets eight point seven five wahoos out of ten.